If you have android auto, this works through that as well. Just say "OK Google" and you can call, navigate, choose music or dictate texts. As long as there is no pinging, 91 is fine. I have the 5.3 which is supposed to be able to run 87 but it tends to have a pinging problem with 87 so I run 91 now. No issues. I think it was only early 2014 models that had the 8.5 qts specified. I bought a 2014 mid to late model year and it was always 8 qts in my documentation. I am talking about myChevrolet or myGMC apps. They are supposed to connect to the vehicles through OnStar to give information about the vehicles. How many of you guys use the smart phone apps from GM? If you do, have you been unable to update the status of the vehicle the last few weeks? I have a couple small spots on my GMC 20". I got them mostly when I had the stock Goodyears on. Worst tire. I replaced with Michelin X LT A/S from Costco. They have been great tires. Much better grip in wet and the sidewall sticks out a bit protecting the rim slightly. I did scrap my wife's less than month old Honda Pilot rim last year. She didn't notice for a few months but when she did, I got an ear full. She has 20" rims as well so looked on ebay and found a single for ~$230. The place claims they buy from a Honda dealership for vehicles that have upgraded wheels put on prior to sale. It has worked well and I now have a rim to make a full size spare out of. My general philosophy has always been to run the lowest octane possible without spark knock. I have actually noticed a little knock with 89 if I accelerate hard but it is fine for general driving. My wife drives a Honda and it runs great on 87. I had the dealer do it. My next door neighbor is the GMC service manager so I'm pretty sure they actually flushed the system as much as possible. I had a bird trying to build a nest in front of radiator so I bought the grille inserts. Problem solved and it looks pretty good too. I just replaced mine as well. Once you get the old one off, you will see that GM changed the design of this part to be more robust. They added additional ribs because these step pads fail at a high rate. If you look at the picture (from the ebay site), the circle support ribs are not present in the pads taken off of the 2014 models. Mine has failed this week at 54,000 miles. I had it in for Stabilitrak issues on Monday and they mentioned that it appeared that the condenser had been leaking. It was cool so I didn't need AC until yesterday. It is blowing warm air now. Not a fan of painted bumpers. 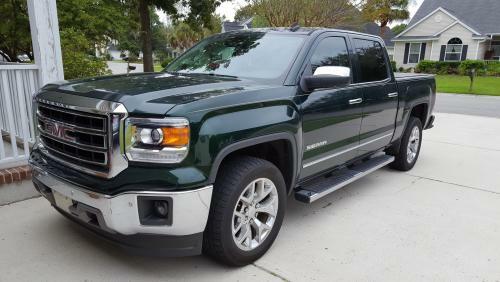 I like the Denali but it needs chrome bumpers in my opinion. I haven't actually had that happen but I did have the opposite problem where only my radio worked. To me, it sounds like the radio module may have gone bad. I had the HMI module go bad in mine. It controls the things that are working in your truck. Yes, those are the controls that don't work when an older system is upgraded. Volume and back/next must be controlled from the main infotainment screen for AA/CP only. Steering wheel controls still work for regular radio and media.